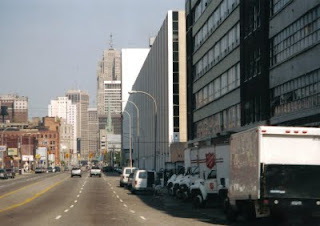 A plan to save Detroit? A recent article by Bruce Katz captured my attention today. 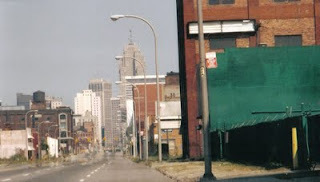 It's entitled 'The Detroit Project: A Plan for Solving America's Greatest Urban Disaster' - strong words indeed. It's of interest to me for a few reasons: 1. urban policy is one of my main research areas; 2. it mentions Sheffield - where I live; 3. it uses European examples in a positive light; 4. it makes international comparisons; 5. my Grandparents used to live and work in Detroit (they were immigrants in the early 1930s); 6. I've been there and seen the city first-hand (see photos below). 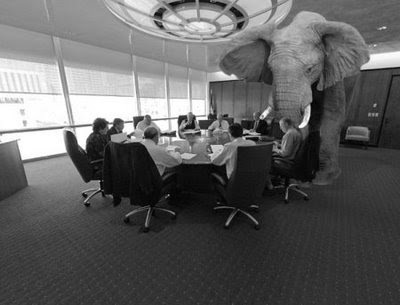 The policy challenges faced in Detroit are huge. The population has halved since 1950, unemployment is at 28% and there are 1,220 violent crimes per 100,000 people. Despite all this, I found it a very enjoyable city to visit. 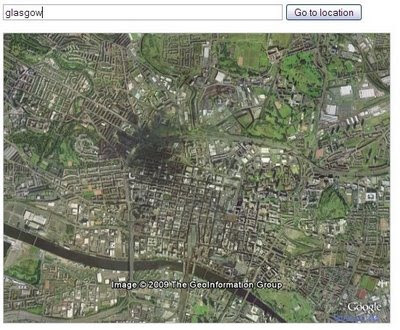 Maybe that's because I've also lived in cities such as Glasgow and Liverpool and I like interesting places. Anyone who has driven along the lower dock road in Liverpool and West Fort Street in Detroit will understand. However, the claim that 'Europe is filled with cities that have risen from similarly miserable conditions' is, in my view, a bit over the top. Having said that, anyone who grew up in Liverpool in the 1980s would understand the comparison. I do agree with the assertion that 'recovery requires at least a generation' - as Katz says. There's a fully fledged article on all this, and links to the downloadable pdf on the Guardian pages relating to this analysis. 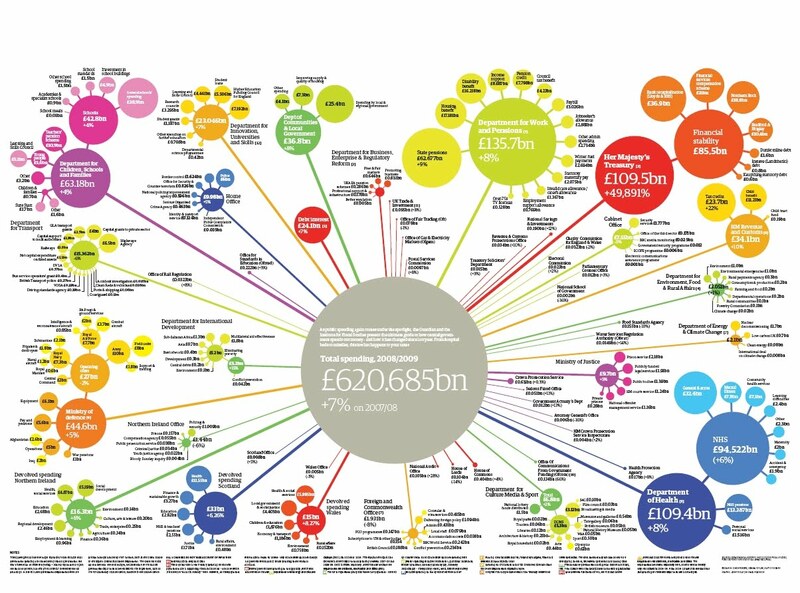 There's also a related flickr page for visualisations. 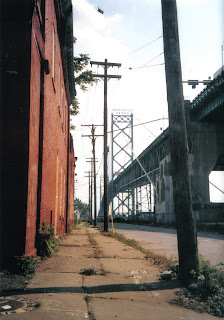 A short post today, on the topic of old industrial landscapes. Specifically, pictures of Kelham Island in Sheffield. I showed some German professors around this area during the summer as part of a short walking tour. I find the area fascinating so here are some photos I took. Click the slideshow below to see the full size version. This post follows on from a recent one about the Scottish Index of Multiple Deprivation 2009 and in particular the interactive mapping function they provide. 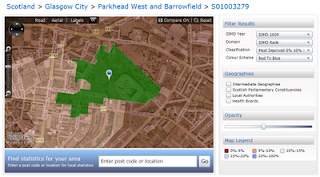 The most deprived area in Scotland, according to the new Index, just happens to be centred on Celtic Park, Glasgow. This is, in technical terms, Data Zone S01003279. But, there's a slight problem - the Data Zones are somewhat displaced. It's not too big an issue in relation to the SIMD data because Data Zones match Ordnance Survey data and the Scottish Government have all this behind the scenes so they do of course know on a street-by-street basis where things are. However, for the online map interface, it does mean that the Data Zone is not in the right place. It also means that people using the interactive mapping facility could end up thinking they live in one area, when they actually live in another since the level of displacement often moves Data Zones into the wrong street. So, it got me thinking. What would you have to do to get the Data Zones in the right place on Google Maps (this also applies to Google Earth)? It's quite simple really (if you're a nerd and you have the right software)... N.B. the SIMD data is not based on Google Maps, but rather the Microsoft Virtual Earth mapping facility. 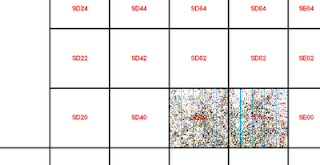 Convert the Data Zone Shapefile from British National Grid to WGS84 in ArcGIS. Best done via ArcToolbox/Data Management Tools/Projections and Transformations/Feature/Project and then selecting the right files for transformation to the correct projection. More useful information can be found here. Use Kevin Martin's excellent Export to KML tool to convert the Shapefile to KML. You can set transparency here and it will export as a transparent KML layer, as in the maps below. If you've got a Google account you can then upload the KML file directly into the My Maps facility and the Data Zone appears there. From there you can add a description and edit in other ways. Here's what it looks like if you don't get the projection right the first time (click the link below the map to see the full thing) - note how the edges of the Data Zone don't match the streets. So, a simple bit of GIS work before putting all this online solves the problem. You can compare any data against any data by clicking below and beside each axis. You can size the bubbles according to any variable and choose to turn any area's data on or off. They're really easy to use. Try experimenting with the example below, or the larger version I've linked to (note that you can click the tabs to the top right of the chart for a different data view). Pressing the 'play' button in the bottom left of the chart will start the animation. All you need to make this is a some data and a free Google account. And a bit of time and patience. Once you get how it works it's really easy, and very effective. This is just an example using some English data. For a REALLY impressive demonstration, see gapminder. For a larger version of the chart shown below, I've put together a separate page. Being of Scottish origin and interested as I am in understanding and measuring deprivation, the recently published Scottish Index of Multiple Deprivation 2009 is today's topic. It updates previous indices (SIMD2004, SIMD2006) and it measures small area deprivation in a way similar to other deprivation indices used across the UK. More information on the indicators used can be found here, and useful background and methodology information is also available. 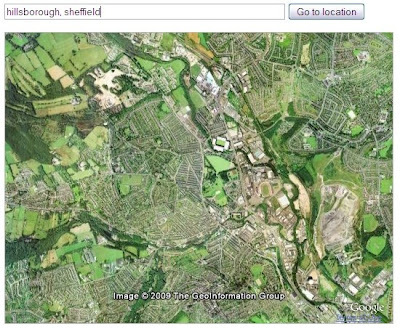 There's now even an interactive mapping function, based on Microsoft Silverlight and Virtual Earth mapping technology. There has been quite a bit of press coverage of this, for example - The Times, The Herald, the BBC, and of course the Sun. There was also a press release from the SNP. 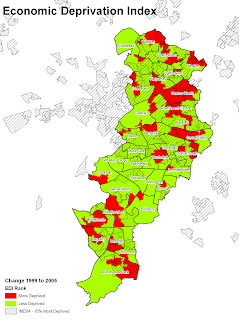 Here's a screenshot showing the location of the most deprived area in Scotland according to the SIMD2009 (click the image to see it full size). "CloudMade helps you make the most of map data. We source our maps from OpenStreetMap, the community mapping project which is making a free map of the world. Our aim is to continue the democratization of geo data and to expand access to open geo data through a range of simple yet powerful tools and APIs." Why does this all matter? Because it's the start of a movement which could make available geo-data which was previously very costly and heavily restricted by licensing issues. It could be particularly good for GIS users in the UK. CloudMade have downloads available for a number of different data types, including Shapefiles, for the entire world. The coverage is sometimes patchy (though not for most areas), but it's growing by the day. Here's the UK downloads page. The Shapefiles are not complete, and the administrative data is in polyline rather than polygon format, but there is a lot of useful stuff here. In conclusion, the UK data is not yet comparable to high cost alternatives, but this is a good start! 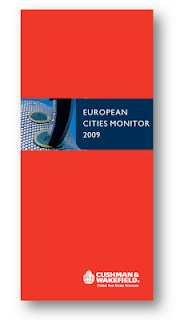 The European Cities Monitor 2009 has recently been published, by Cushman and Wakefield, a global real estate firm. They've been doing it since 1990 and it is, essentially, a survey of Europe's major business centres. Istanbul moved from 29th to 27th. In total, 500 companies were surveyed and 34 cities were included in the analysis. Today, I thought I'd write about the Regional Studies Association (RSA) and what they're all about. I am involved with the RSA in a professional capacity but have also enjoyed their conferences, events, and journals for many years and my interests are very much aligned with those of the organisation. "The Regional Studies Association is a learned society concerned with analysis of regions and sub national issues. Through our International membership we provide an authoritative voice of, and network for, academics, students, practitioners, policymakers and interested lay people in the field of regional studies." So, if you're interested in regions, cities, regional economics, spatial analysis, urban issues and anything related to any of these areas, the RSA is likely to be relevant to your work. The international conferences are also really good and in 2010 it takes place in Pécs, in Southern Hungary (about 215km from Zagreb, and 200km from Budapest). 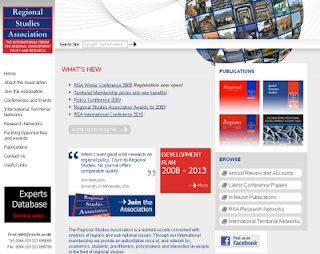 A screenshot of the RSA website is shown below. Take a look by clicking the image. I was at an ESPON UK event recently. 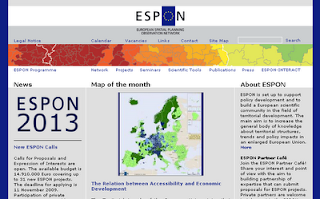 For those unfamiliar with ESPON, it stands for the European Spatial Planning Observation Network and there is a UK section which is administrated by the Royal Town Planning Institute (RTPI). The main aim is to increase the general body of knowledge about territorial structures, trends and policy impacts in an enlarged European Union. Typically, the main things that people see from ESPON are lovely colourful maps covering the EU plus 4 other nations (to fill in the gaps). I recently bought Camtasia Studio 6, after previously using versions 5 and 3. It's a tool for screen recording (or screencasting, as some people like to call it). I use it for all my screen recording work, so I thought I'd do a quick video of how I use it. So, what you see below is a video of me making a video - which is kind of mind-boggling to do. To record me recording the screen with Camtasia I used Camstudio - a free screen recording app. The video below just gives an idea of how you can use Camtasia to record your screen. I don't usually use any format other than flash for the web, but in this case I've encoded the video to wmv, just for the blog. 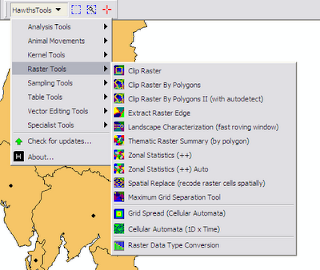 A short post today about another useful tool for ArcGIS - and what I've used it for. ET SpatialTechniques for ArcGIS is a free download. Some functions are restricted unless you pay, but the functionality of the free version is great. I've used the tools here for quite a few years and they keep getting better. The person behind it is called Ianko Tchoukanski. I've shared this file with the higher education GIS user-community in the UK, and it is available from the new ShareGeo section of digimap. It really is great, and it's a FREE download. This is a short post about some recent GIS-related work I've been doing. I've moved on from all the original flow-mapping geovisualisation stuff to consider how best to illustrate spatial dynamics for urban systems. One way is a 3D geovisualisation of the kind shown below. 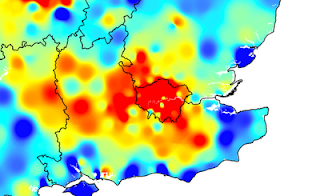 What I did was create a raster surface of net commuting (by district) for the whole UK in 2001 (the latest data). 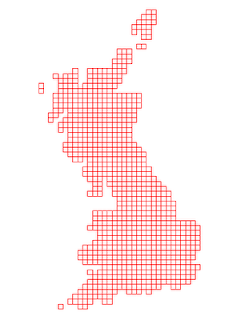 Then I created a flow map vector layer for the UK at district level. Then I chopped out Greater London, displayed only those flows of more than 1,500 commuters, and put this together with the raster layer. The final image communicates a lot of information quite simply. In the image below (click on it to view full size), the red peaks are areas of high in-commuting and the blue troughs are areas of out-commuting. The flow lines illustrate the spatial patterns of movement. Note the area of high in-commuting to the west of London - the Heathrow effect. I've just returned from Liverpool where I attended the 2009 AESOP Conference. AESOP stands for the Association of European Schools Of Planning, but there were people there from all over the world, including Brazil, the US, Australia, Canada and New Zealand. It was a very interesting, busy and enjoyable conference and was hosted by the Department of Civic Design at the University of Liverpool. View more presentations from Alasdair Rae. "The White House Office of Urban Affairs and the Domestic Policy Council hosted a day-long discussion about the future of America’s urban and metropolitan areas. Participants included policy experts from across the country, several cabinet members, and elected officials. Discussions covered the evolution of metropolitan areas, best practices in urban communities, and how the federal government can be a more effective partner in these communities." About the future of America's urban and metropolitan areas. Are we seeing an true upswing of the policy pendulum? Will this impact on other nations? I expect the answers are 'yes' and 'yes', that's why I'm keeping a close eye on developments. 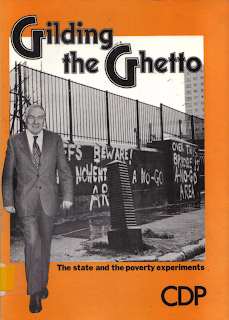 This post is all about a publication called Gilding the Ghetto that came out in 1977. It is something of a classic in the urban/social policy literature because of when it was written, who it was written by, and what is in it. It's also quite difficult to track down and even harder to get hold of a copy of your own (there are no more 85p copies available from The Home Office Urban Deprivation Unit!). Perhaps the balance between critique and solutions/recommendations could have been better, but overall this is a must-see piece of work for people working in this area. The section on 'Social pathology' on page 54 is particularly relevant in relation to how the problem is conceptualised at a national and local level. Finally, I've scanned the front and back covers. If you click on them you will see them close to real size. Isolated Entities or Integrated Neighbourhoods? The front page of the paper is shown below, but for the real thing you'll need to see Urban Studies itself. Where to go for information on urban policies in different European countries? 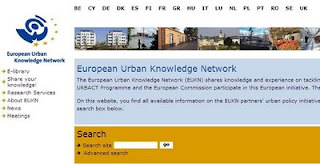 The European Urban Knowledge Network website is a very good place to start. Moving on from my earlier work on mapping migration with flow maps, I've now begun to think about mapping commuting. So, rather than look at residential mobility I'm focusing on labour market dynamics. Actually, I find this more interesting and there has been some good work on this recently - for example, by Nielsen and Hovgesen in 2005 and 2008. 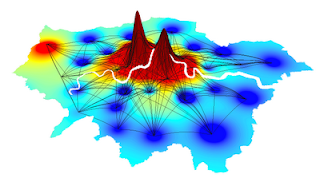 Even more recently than this (May 2009), Killer and Axhausen of ETH in Zurich produced a paper on Mapping Overlapping Commuting Areas. It is very interesting and even mentions my 2009 paper on flow mapping (though I wrote about migration and not commuting)! So, a new flow-mapping-related project is in the works... Look out for more in the future. Yes, that's right, it is now called PASW. That is Predictive Analytics Software - surely this should be PAS. The main problem I have with this is the name - should we pronounce it 'pazwuh'?. I've been looking at their re-branding spin and it appears this change was simply 'essential'. However, the numbering has continued so this is PASW 17, with screencast demos available here. Of course, this must all come as a bit of an annoyance to Andy Field (or an excuse for a new edition) and his excellent textbook on SPSS/PASW. Actually, I've just noticed that despite the name of the book, it has been 'fully updated with PASW Statistics 17'. And so ends the most unnecessary blog post ever. Knowledge and technology in urban development. How are cities harnessing knowledge and technology to increase the quality of life for their citizens? Whither local economic development in a rapidly changing world? Community development, migration and integration in urban areas. How are cities coping with rapid population movements – both into and out of cities? What are the implications for housing, urban regeneration and community building of international population shifts? Architecture and the design of the public realm. The quality of architecture and urban design affects the quality of life in cities. What innovations are taking place in urban design and planning at street level? Are cities redesigning themselves to cope with new challenges relating to, for example, public safety? I didn't manage to make the 2008 conference in Milan, but did go to the 2007 version in Glasgow where I presented work on migration and neighbourhood change with Kitty Lymperopoulou. In Madrid, I'm talking about area-based urban policies and the complications of this kind of spatial targeting. For more on Spanish urban policy, as opposed to urban policy being discussed in Spain, the European Urban Knowledge Network is a good place to start. I've been pretty busy with lots of things recently, such as marking student work, getting ready for conferences (e.g. City Futures '09 in Madrid) and trying to do more screen recording - though this has involved lots of testing and experimentation with audio codecs. I've also been writing about area-based interventions in urban areas and monitoring spatial planning outcomes as a follow up to previous work. Lots going on but not much useful blogging, so I thought I'd post this video since it reminds me that in paying attention to the details you can often miss the moonwalking bear. Hopefully I don't miss any of these in my work... Take a look at the video to understand. A new piece of work has recently been published by the Manchester Independent Economic Review (MIER), a Commission set up to provide an evidence-base for decision making in the Manchester city region (MCR). The publication is called 'Sustainable Communities' and is an overview of deprivation and neighbourhoods in MCR. 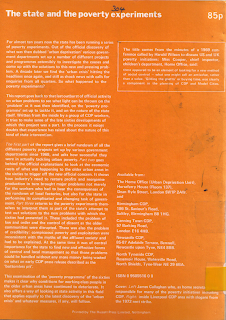 Some of the material is related to work I was involved in during my time at the Centre for Urban Policy Studies in Manchester and I still have an interest in what's going on there. Changes in neighbourhoods in many parts of MCR have been good, but the performance varies across the different areas. Since I'm doing some work on indicators and spatial policy monitoring at the moment, I thought I'd do a short post on this topic. In particular, I wanted to explore the changes in the percent of people in each Greater Manchester district (Bolton, Bury, Oldham, etc...) who live in areas ranked among the 10% most deprived nationally between the Indices of Deprivation from 2004 and 2007. In actual fact, of course, the IMD2004 is based mainly on data from 2001 and the IMD2007 on data from 2005 - so the comparison here is really between conditions in 2001 and 2005. Nonetheless, I wanted to see how things had changed. As you can see, the population of Manchester within the 10% most deprived nationally (England) has fallen by around 8%. This is the most obvious change. Falls were also evident in Bury, Salford, Trafford and Wigan. In contrast, Bolton, Oldham, Rochdale, Stockport and Tameside (marginal) saw a rise in the population ranked amongst the 10% most deprived nationally. Notwithstanding such issues as the ecological fallacy and questions about the validity of such indices in the first place - the changes are very interesting - particularly when we begin to ask questions about how these changes have occurred. Has it been because of household mobility, increased prosperity, or another reason? That's for someone else to answer. For now, I'll just finish by adding this chart on population changes between 2001 and 2005 - it makes an interesting comparison (has the increase in Manchester's population between 2001 and 2005 been a process of displacement of less well off people by more affluent people? maybe). A short post today on the topic of polycentric urban regions - a topic that has become quite popular in the academic literature over the past few years. I'm mentioning this because I am planning to do some work comparing British and Japanese polycentric urban regions in the near future, with a colleague in Japan. This work might explore the similarities and differences between the north of England and the Kansai region in Japan. In the latter, the metropolitan areas of Liverpool (Merseyside), Manchester (Greater Manchester), Leeds (West Yorkshire) and Sheffield (South Yorkshire) form one such area. 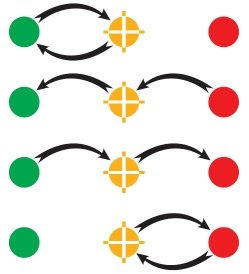 The image below is from another piece of research I recently did on flow mapping for a journal article. 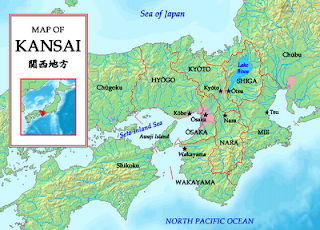 In Japan, the Kansai region is located in the southern central area of Honshu, the largest of the Japanese islands. The major cities there are Kyoto, Osaka and Kobe but there are many more important settlements in the region (see below). This region is much more highly populated than the English example, but they share many common features. It will be interesting to contrast and compare these two examples and to simultaneously test the validity of the polycentric urban region paradigm. A short post today in answer to a question. I previously blogged on the population of Inverness, but someone asked if it could be expanded to include Nairn. The section between Inverness and Nairn on the A96 corridor is currently the focus of much interest and big plans so this is a topical issue. 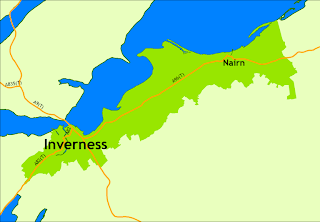 Very simply, the masterplan involves increasing the population between Inverness and Nairn by 30,000. This areas was identified as a strategic location in The National Planning Framework for Scotland in 2004. So, growth looks likely... But how many people are living there now? Well, based on 2007 population estimates, the figure is 68,642 - in the area indicated in the map below. If the proposed growth happens (notwithstanding the current economic situation) then the Inverness-Nairn 'city region' would have a combined population of around 100,000. Relatively recently, the Department for Communities and Local Government released the Economic Deprivation Index for the purposes of 'tracking neighbourhoods' through time in relation to their levels of economic deprivation. 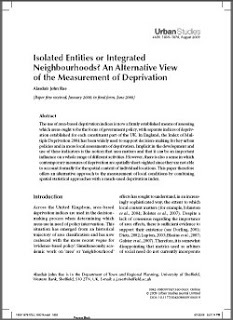 They did this because the existing Indices of Multiple Deprivation (2004 and 2007) 'do not facilitate backwards comparison nor do they enable users to understand how the pattern of deprivation is changing between these fixed points' (CLG, 2009). Despite this, several examples of comparison between 2004 and 2007 deprivation levels have been produced at the local level - e.g. exhibit a, exhibit b - though I'm not picking on anyone here; I actually think there is a good deal of confusion that needs to be addressed since the new EDI says what is quoted above and the information on the 2007 Indices of Deprivation page says 'comparison between the two Indices is therefore acceptable'. So, it is hardly surprising that people compare IMD 2004 and 2007. Anyway, back to the topic at hand. The EDI is comprised of data from the Income and Employment Domains of the IMD and is produced on a yearly basis from 1999 to 2005. The maps below summarise changes at LSOA level, where green is an improvement in rank and red is a reduction in rank. You can click on the images for larger maps. More commentary follows below... but the official report is worth a look. A couple of nuggets here for England as a whole... The largest change in rank towards being more deprived was 17,769 - for a LSOA in Slough (008D), which changed from a rank of 31,509 in 1999 to 13,740 in 2005. Since LSOAs are quite small, and the data very sensitive to micro-spatial factors, such changes are not entirely surprising (but I do wonder what happened here). In total, 27 LSOAs saw their rank change by 10,000 or more places towards being more deprived and the majority of these were in the south of England. At the other end of the scale, there were 22 LSOAs which changed rank by 10,000 or more towards being less deprived. The LSOA experiencing the largest improvement was in Tower Hamlets (029A) with a rank change of 18,463 places. In 1999 it was ranked as the 12,878th most deprived in England (so, not really that deprived) and by 2005 it had moved to 31,341. More interestingly, one LSOA in Nottingham (026C) was amongst the most deprived in 1999 (ranked 3,150) but by 2005 was ranked 16,873 (a change of 13,723 places - the fourth largest improvement). The big leap forward came between 2002 and 2003 (new build 'luxury apartments'?). We can also take a closer look at London - there does seem to be a more obvious pattern of change between 1999 and 2005 than for England as a whole. This is clearer towards inner London and perhaps reflects even more severe housing market pressures in the capital - particularly in Westminster, Islington, Tower Hamlets and Hackney. 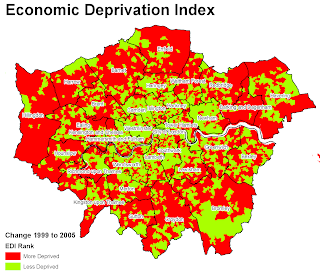 The outer boroughs, and Hillingdon in particular, seem to have become more deprived according to the EDI - although this is all relative of course because some of these areas are not at all 'deprived'. And now to Manchester, because it is the location of the LSOA that has remained most deprived on the EDI for each year from 1999 to 2005 (Manchester 009C). The overall pattern looks not too bad, with mostly greens. 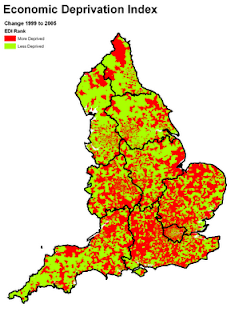 However, when you overlay the location of the 10% most deprived LSOAs (2004 IMD - since these are the main policy targets), things don't necessarily look so good. Lots of areas which remain the focus of policy have not improved on the EDI - they have become worse according to this measure. The exact change in rank may not be statistically significant but it is notable that they have not been able to improve rank at all. I'll not go into whether or not such indices are a useful measure - that's not for me to decide. I just thought it would be useful to explore the data for now. So, that's the Economic Deprivation Index... Now I need a holiday. Things have been quieter on the blog front recently because I've been in Lille from 1-5 April and then Leuven from 5-9 April at the Regional Studies Association International Conference 2009. The event brings together key thinkers (not that I think I'm amongst them!) in regional studies from across Europe and the wider world, though it tends to be mostly European. Papers given at the conference were varied and reflect the broad constituency of the field of regional studies itself. So, we find economists mixing with geographers, planners and those who transcend disciplinary boundaries. 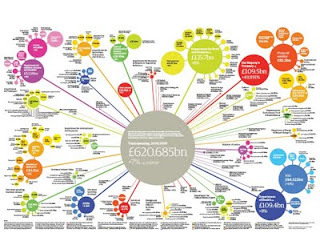 Of particular interest for me here was the special session centred on DCLG (a government department in the UK, with responsibilities in England) and the establishment of the new spatial analysis unit, headed by David Wood (economist by training). There were three pleasing aspects about this for me. First, the fact that David Wood and Verity Morgan from DCLG were in attendance in the first place - very good. Second, the fact that there is a new unit within DCLG dedicated to spatial analysis - this is right down my street, as previous posts have shown. Finally, the fact that senior people in the Department are enthusiastic about this kind of work, and particularly work which I had a key role in - I've blogged on it before. I'm going to the Regional Studies Association conference in Leuven soon, so thought I'd post briefly on the topic I'm presenting on (with Prof. Cecilia Wong from the University of Manchester). It's all about the complexity of spatial policies and the difficulties of monitoring them. So, a very quick example. 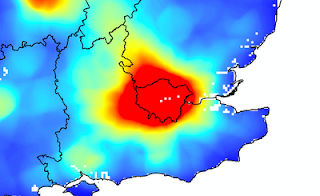 The two images below show migration and commuting raster surfaces for the South East of England. The first shows migration, where red is lots of out migration and blue means in migration. The second shows commuting, where red means lot of in commuters and blue means lots of out commuters. The black lines are regional boundaries. So, lots of complex spatial processes operating at inter and intra regional levels. This is just one quick example of how monitoring what's happening in one place is linked to lots of other places and to lots of other issues. Further to my last post about Google Maps street view, where I said that it wasn't available in the UK - just this week it has become available, to much hype and hysteria. Twenty five cities in all, including where I live now (Sheffield), where I used to work (Manchester), where I used to live (Liverpool) and where I went to university as an undergraduate (Glasgow). I've hunted around for people I know, but no luck yet... For now, just some images of places I know - note that you can navigate these within the blog! Very short post today. I'm going to Lille soon and wanted to do some exploring beforehand. Thanks to the good people at google anyone can visit places before they go there with google maps - street view. I recorded this short video with screentoaster. No coverage in UK for now, but it will arrive soon I'm sure... For now though, that's all. If you want to view the video in full screen, just click in the bottom right of the smaller version below. Geographical metaphors and images are popular ways of presenting concepts in spatial planning. In 1989 a group of French geographers led by Roger Brunet published a report for DATAR, the French spatial planning agency (since updated). The report was about European cities and spatial planning and took a comparative approach, hence the title: Les Villes Européennes: Analyse Comparative. Basically, they identified a strategically important area roughly stretching from the southern midlands of England to northern Italy, taking in parts of Belgium, northern France, the Netherlands, southern Germany, Luxembourg, Austria and Switzerland along the way. The edges are somewhat fuzzy since it was only really supposed to convey the general idea of a European megalopolis. The group of French geographers (RECLUS) named the area the dorsale (or backbone) since they said it signified the core European area in terms of population and productivity, with around 90 million people. When they presented their work at DATAR, the planning minister of the time (Jacques Chérèque) asked what the banana shape was on the map (it was coloured blue). This was overheard by Josette Alia, writing for French magazine Le Nouvel Observateur. A few days later there was an article with 'la banane bleue' in the title and an icon was born. Since then we have had the 'bunch of grapes', the 'golden triangle' and the 'yellow banana'. There are even more bizarre fruit and vegetable references out there if you want to look. The point is this: spatial metaphors help us understand spatial development and can be very powerful in shaping understandings of how places are connected (or not). 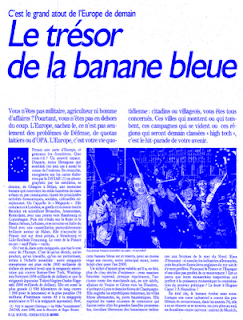 The original blue banana article can be found on the web pages of Le Nouvel Obs, the magazine that first published it. I've done the legwork for you - the PDFs are in separate pages, so here's page 74, 75 and 76, from May 18, 1989. White House urban policy - is the pot boiling again? One of my main (if not the main) research interests is urban policy. So, the newly created White House Office of Urban Policy, to be headed by Adolfo Carrión, is of great interest to me. It also makes me wonder whether this will spark a much wider interest/debate about the way urban policy is developed, applied and evaluated (too optimistic?). Either way, it seems to be a recognition that urban issues need to be given more attention than they had been given in the past. In 1987 Donald Hicks said that urban policy was a 'pot no longer boiling' - there has been an upswing since then, but is the pot now really back on the boil? Or, is this all post-election gesturing? I'm enthusiastic about these new developments, but realistic about what can be achieved and more than a little cautious about claiming this is a new dawn for urban policy, or some other such thing. Is this simply the US equivalent of the UK's New Labour re-dedication to urban policy in the late 1990s? Let's all wait ten years before we answer this question. For now, it's interesting, welcome and encouraging. 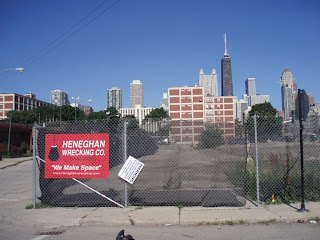 The image below is from behind the Lake Michigan skyline in Chicago's Near North Side - just on the edge of Cabrini-Green. As you can see in the photo, urban policies often involve demolition of existing neighbourhoods. Will this approach (much criticised) continue? Right now I'm working on a new paper, all about area-based urban policy interventions. This follows on from work in my PhD and, specifically, looks at whether the different geographically-targeted policies in operation in cities across the developed world are actually working. Although I've more recently blogged on more technical things, such as flow mapping, the field of urban policy and evaluation is my main area of interest. One thing to mention first: terminology. In the United Kingdom, we tend to talk about area-based initiatives, whereas in other places people use different terms (such as 'strategic, geographic targeting'). Right now, I'm interested in finding out more about why the approach has remained popular for 30-40 years despite the lack of success that has been had. I'm not saying there have been no successes - far from it. What I am saying is that the results seem at odds with the level of investment of time, money and effort. This appears to be the case whether you look at the United States, the United Kingdom, Canada, Denmark, France, New Zealand, Australia, or many other nations. Successes in urban policy interventions are typically modest, and stand in contrast to the political rhetoric and optimistic enthusiasm which they are often founded upon. So, what to do about this? Keep trying with the same methods? This seems a bit foolhardy. Try something new? If so, what? There are no easy solutions but it seems that the area-based approach to policy intervention is a bit of a puzzle. Like an old friend that you are still friends with but can't exactly remember why. It can be very difficult keeping up to date with all the new academic literature that you may find relevant/interesting/useful. One useful tip here is to get an iGoogle account (it's very simple - see here) and then add a new tab for RSS journal feeds. After that, just go to journal home pages, copy the RSS feed address, and paste this info into the relevant RSS place in iGoogle - very simple. I've written quite a bit about flow mapping on these blog pages. It's only been a sideline of mine in terms of research but has consumed a lot of my time over the past year or so (well, more like three or four). 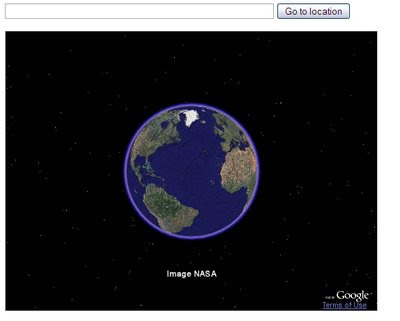 So, one final image, embedded in Google Maps. This one shows gross flows of migrants between Glasgow wards from 2000 to 2001 (gross flows = two-way; that is, the total flow in both directions between two wards). Click on individual lines for more information. If you want to see the map full size in Google Maps, click the link below this smaller version and it will open. January has been pretty quiet on the blogging front, but that's because I've been working on papers. One of these is in revision and the other is a new piece of work based on my PhD writings (but it's taken on new life too). Anyway, more on the former. I'm attempting to revise a paper on flow mapping and to make things more interactive and more effective so I decided that I would build a small site in google sites and then put links to content there. So, if you're at all interested in flow mapping, kml, google sites, GIS, spatial interaction or anything closely related to any of these it may be of interest. If not, it does look quite nice. There's an introductory page, some information about the data, a few colour maps, direct links to kml files overlaid onto google maps and some links to the KML files on my web space. There's also a few words about me and about the project that all this came from. As you can see, I've also added a slightly psychedelic banner. Link to site here. http://ajrae.staff.shef.ac.uk/ge1.html - if your browser says 'load failed' or something similar, just click 'Ok' and where the Google Earth image should be you can install the plug-in from there.